Marvel Schebler and Precision Airmotive are excited to announce that they will be attending the 2015 Sun ‘n Fun International Fly-In and Expo in Lakeland, Florida. If you plan on attending, come visit us at booth number C-58. This year, Sun ‘n Fun is sure to be an amazing event. One of the most exciting features is the scheduled performances of not just one, but two reputable jet teams; Breitling and the USAF Thunderbirds. Breitling is kicking off its first ever U.S. tour at Sun ‘n Fun on April 21, and will continue to perform throughout the week. This aerobatic display team consists of seven L-39 C Albatros jets and is the first and largest of its kind. The team “embodies the very essence of daring, speed, and audacity,” flying at speeds of up to 435 mph within 10 feet of each other. The USAF Thunderbirds will also be performing on April 25 and 26. This team of American Airmen performs sharply choreographed, drill-style demonstrations. Solo pilots will also show off the capabilities of the F-16 Fighting Falcon; the Air Force’s premier multi-fighter jet. Aside from these two amazing jet shows, other airshows will take place daily, as well as a few nightly airshows. At the airshows, there is something for everybody. Tuesday shows will feature world aerobatics, Wednesday is Warbird day, and Thursday is all about formations. The original Batcopter from the Batman TV series and first Batman movie will also be performing. 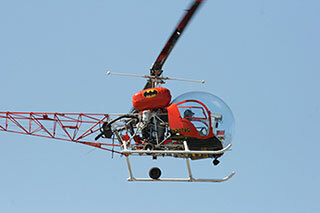 The Batcopter has recently been upgraded with a Marvel Schebler carburetor for enhanced performance. Throughout the week there will be countless forms of entertainment including a balloon launch, a car show, evening movies and dinners, forums, workshops, and plenty of speakers. New features this year will include the Young Aviator’s Camping Area and a new and improved Warbird ramp. Women in Aviation International (WAI) is also excited to host the third annual Sun ‘n Fun Women in Aviation Luncheon. This event will feature a panel of speakers including WAI President, Dr. Peggy Chabrian. At Marvel Schebler and Precision Airmotive, we are counting down the days until Sun ‘n Fun 2015! Don’t forget to come see us at booth C-58. We hope that you get a chance to enjoy Sun ‘n Fun with us this year.